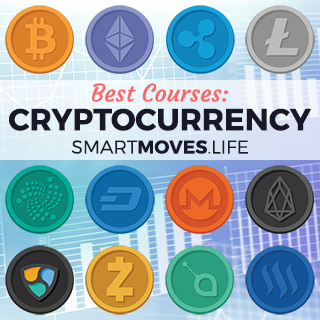 Tip: Udemy is currently having a $9.99 site sale so now is a great time to stock up on the cryptocurrency courses that interest you. You can start learning right away and you get lifetime access. A great place for beginners to get started with Cryptocurrency. What You'll Learn: Overview of the various types of coins. Advice for investing in cryptocurrency. Overview of cryptocurrency mining. How to get started and set up a cryptocurrency wallet. How to buy / sell / trade cryptocurrency. Understand the fundamentals of Bitcoin, the most popular cryptocurrency. What You'll Learn: Gain a firm understanding of the fundamentals of Bitcoin. The advantages of Bitcoin vs the traditional financial system. Learn how to buy Bitcoin. How to set up a hardware wallet to store your bitcoin securely. How to spend bitcoin and who accepts bitcoin. Ethereum is the number 2 cryptocurrency by market capitalization and it’s gaining in popularity fast. Understand why and how to get involved. What You'll Learn: Understand what Ethereum is and how it compares vs Bitcoin. Setting up an Ethereum wallet and making transactions. How to buy and sell Ethereum. Ethereum opportunities for early adopters. Remember that cryptocurrency is a new asset class. So there are a number of factors that you need to take into consideration to reduce your risk: There is currently relatively little regulation, compared to established markets such as the stock market. Cryptocurrency has a short track record, which makes it difficult to predict how it will behave in the future. Also, there is a great deal of buzz around cryptocurrency, which gives rise to speculation. Having said that, it’s a great idea to be well informed about how to invest in cryptocurrency and related projects, so that you are in a position to take immediate action when the right opportunities arise. What You'll Learn: How to find the best exchange for your needs. Overview of the top 10 Cryptocurrency coins. How is a cryptocurrency's value is determined? Build a cryptocurrency portfolio that matches your risk tolerance. Financial security, including how to set up a digital wallet. Investment strategies including technical analysis and chart reading to identify opportunities. ICO (Initial Coin Offerings) are very popular at the moment because they are a chance to be a part of a revolutionary technology and make a lot of money. Unfortunately there are also a lot of scam ICOs due to the amount of money being generated and the lack of regulation. My advice: Don’t get carried away with “hot tips” from just one source of information. Establish a framework/checklist of items to check for any potential ICO investment and check these items with various different sources. Blockchain technology is revolutionary and it will give rise to amazing new applications and companies: The billion dollar question of course is which are the companies that will make it happen! What You'll Learn: Overview of the ICO process. The advantages of ICOs. Comparing new ICOs to existing successful ventures. How to invest in an ICO. Checklist to evaluate an ICO. Current ICO law and implications. The technology that makes Bitcoin possible is called Blockchain. Despite its mundane name, Blockchain is a revolutionary technology that enables huge improvements to key industries including business, health, logistics and many others. I recommend getting to know how it works: A good way to start is by understanding how it has made Bitcoin such a success. What You'll Learn: Get a solid understanding of what Blockchain and Bitcoin are and how they are related. Understand all the key concepts used in Bitcoin and blockchain: Glossary with 100+ cryptocurrency terms included. Understand smart contracts, digital tokens and business applications of cryptocurrency. Gone are the days when geeks could hook up their own home computer to mine Bitcoin. Cryptocurrency mining has become big business due to the meteoric rise in the number of transactions and the price of cryptocurrencies. It is still possible to make money mining bitcoin and other cryptocurrencies: The smart way to do it is to join an established state-of-the-art cloud mining operation. What You'll Learn: How to Invest in Bitcoin Mining. How to create a profitable cryptocurrency mining set-up. Overview of the cloud mining operations: Genesis Mining & Hashflare Mining. How to re-invest or cash out your mining profits. Due to the success of the currency, Bitcoin professionals are in huge demand. A great way to land a top bitcoin job is to pass the Certified Bitcoin Professional Exam. Put the qualification on your CV and get a top job in this exciting new industry! What You'll Learn: Learn everything you need to know to pass the Certified Bitcoin Professional Certification. Access to practice exam questions. Have the complete reference materials on hand for the Certified Bitcoin Professional exam. If you’ve already got the basics of cryptocurrency figured out, you may be considering a career in cryptocurrency. Here’s a more advanced course on cryptocurrency, particularly if you’re interested in the more technical aspects. What You'll Learn: A more technical deep dive into how bitcoin works: How does bitcoin security work? How anonymous are bitcoin transactions? What factors affect the price of bitcoin? What can / should be done regarding cryptocurrency regulation? Predictions for the future of cryptocurrency. Bitcoin And Crypto-Currencies For Shopify Store Owners – Learn how to accept cryptocurrencies on your website and move to the cutting edge of ecommerce. Steemit, Cryptocurrency Blogging Platform With No Overhead! – Learn how to use Steemit, a blockchain version of Reddit where you get paid in Cryptocurrency to write posts. Dash – The Cryptocurrency Guide for Beginners – Learn about the Dash Cryptocurrency including its key benefits: Instant payments, privacy, security and low transaction costs. Learn how to set up and use a Dash wallet. How to buy Dash, how to spend Dash and where Dash is accepted. Remember to share this page so we can accelerate the benefits of cryptocurrency for everyone!